Softsheen-Carson Dark & Lovely recently launched the Au Naturale line specifically for natural styles. The Au Naturale Anti-Shrinkage maintenance and styling line is infused with mango oil and bamboo milk to provide all-day hydration, elongation, definition and nourishment for all curl types. The Au Naturale line includes a Hydrating Soak Shampoo, Knot-Out Conditioner, Curl Defining Crème Glaze, Coil Moisturizing Soufflé, Sheen Sealing Nectar and 10-IN-1 Styles Gelee, which contain no drying alcohols, mineral oil petrolatum or parabens. 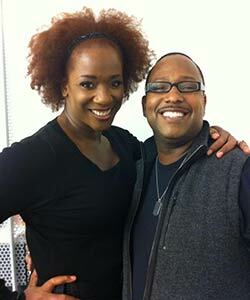 NaturallyCurly sat down with Softsheen-Carson educator and natural hair afficionado Mezei Jefferson to talk texture. NC: When did you begin to see more women transitioning to natural hair? Jefferson: I began to see more women go natural about six years ago in Chicago. More women — including my own sisters — were becoming more concerned about chemicals damaging their hair, and started to wait longer and longer between relaxers. At the time no one knew they were transitioning. It just happened. NC: What are your biggest tips for women thinking of making the transition? Jefferson: Make sure to keep your ends trimmed at least every 6-8 weeks. Deep condition often. Also, after about three to four months of transitioning, start to use less heat and stop straightening your hair. Straightening and excessive heat can cause protein loss and can cause your natural curl pattern to lose definition. NC: What are some of the hottest natural hair styles? Jefferson: The current hottest natural trends are twist outs. They are easy to do at home and look amazing. I'm also seeing a lot of braid outs and flat twist outs to create nice waves and corkscrew effects. NC: Tell me about the new Au Naturale line and what makes it unique? 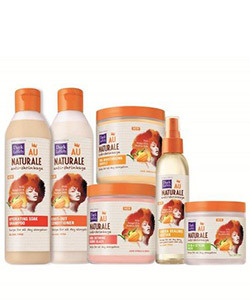 Jefferson: The Au Naturale line is amazing and has a full line of products for natural hair. All of the products contain mango oil and bamboo milk for an anti-shrinkage recipe to give your curls and coils all day elongation. We have a curl product for all curls and coils. NC: What is your favorite product in the Au Naturale line? Jefferson: My favorite product in the line is the Coil Moisturizing Soufflé. It is for tightly curled to coiled hair, and provides moisture to hair without stickiness or weighing hair down. Get to know the NEW Dark and Lovely® Au Naturale line, and once you've tried it out be sure to let us know what you think in our Reviews section! Hydrating Soak Shampoo - A rich quick lathering cleansing shampoo with mango oil and bamboo milk that moisturizes hair and scalp. Knot-Out Conditioner - A moisturizing conditioner that provides the ease of detangling you crave. Hair is immediately softened, easy to comb through, and protected from dryness. Curl Defining Crème Glaze – Indulge your curls with this delectable recipe of lightweight moisture and definition. It nourishes and conditions using mango oil and bamboo milk to define each coil with the perfect amount of hold for curly and wavy styles creating healthy looking, frizz –free, silky ringlets. Recommended for loose curls and spirals. Coil Moisturizing Soufflé – Treat your curls with this moisturizing soufflé that Defines and moisturizes using mango oil and bamboo milk, tightening curls and coils to make hair soft and manageable. Recommended for tight curls and coils. Sheen Sealing Nectar - Conditions hair and scalp using mango oil and bamboo milk for instant hydration and a succulent sheen. Revives coils, curls and waves for superb curl definition that lasts. Next day coils, curls and waves look and feel refreshed and brilliantly defined without shrinkage or frizz. 10-IN-1 Styles Gelee – The 10-In-1 Styling Gelee provides frizz control while elongating curls and defining styles. The gelee offers multiple styling options with a firm hold including: two-strand twists, faux hawks, flat twists, coils, bantu knots, cornrows, twist-outs, braid-outs, bantu knot-outs, and coil-outs. Recommended for all curl types. All are priced at just $9.99, and contain NO drying alcohol, NO mineral oil, NO parabens, NO petrolatum!